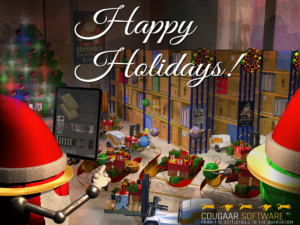 Cougaar Software, Inc. (CSI), an innovative technology company in the Washington D.C. area specializing in cognitive computing and distributed intelligent agent solutions, announces the release of its 2016 holiday card for the season. As the holiday season is upon us, we find ourselves reflecting on the past year and those who have helped to shape our business. It’s been quite a year for us all! We hope that 2016 has been just as memorable for you, your colleagues, and your loved ones. The team at CSI would like to wish you and your family a joyous holiday season with peace & prosperity in the New Year! CSI leverages advanced cognitive computing concepts and technologies to provide next generation planning, decision support, and optimization systems for military and commercial customers. These solutions are built on CSI’s ActiveEdge® platform, a distributed, intelligent cognitive agent development framework based on the DARPA open source Cognitive Agent Architecture (Cougaar) technology. CSI’s cognitive computing technology enables users to understand and manage complex situations. Armed with CSI’s intelligent, automated, deep reasoning capabilities, users harness massive amounts of data to make better decisions, faster, and with greater confidence. To view previous holiday cards, please visit http://www.cougaarsoftware.com/careers/our-culture/holiday-cards/.